The development works at the new Gasa town in Kolikha located about a kilometre away from the dzong has begun. “We have completed the construction of a waste disposal site and also carried out a feasibility and preliminary survey of an alternative water source at Samjaynachhu because the current source is not sufficient,” Tanshan Bhattarai, the Municipal Engineer, said. The land in the current town belongs to the government. 29 shopkeepers received lagthrams of their plots in the new township last month. The plots were granted to the shopkeepers as land kidu by His Majesty The King. “We will now have a permanent place to stay and do business. We are thankful to His Majesty,” Namgay, the town representative, said. However, the plot owners have to wait for the basic amenities to be in place before they can start constructing houses. “It might take around two to three years. Only by then, we will be able to provide approval for private construction,” Tanshan Bhattarai said. The Dzongkhag is planning to develop the new town into a model town. “All the structures will be traditional in architecture and designs. The houses will be two-storied and constructed with traditional materials like mud, stones and timber,” Dorji Dhradhul, Gasa Dzongda, said. 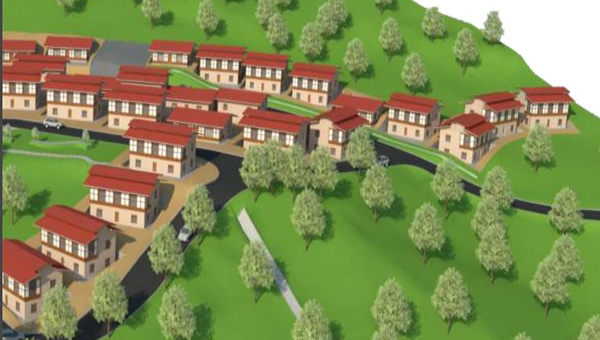 The dzongda said the present town area below the Dzong will be developed into an institutional area, while the new town will serve as a commercial hub for the Dzongkhag. The over 74-acre new township area will have separate car, taxi and bus parking areas and children’s park among others.